On the Teleportaloo: Green Means Go! It was fun getting VIP tickets on the first Green Line train. 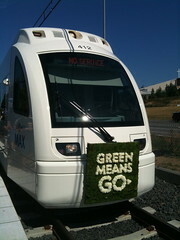 (To get the tickets you just had to go to a store in downtown Portland and say the secret password - "Green Means Go!"). However, I imagined VIP meant champagne and nibbles. Actually it meant we got a seat, which was really great as the train was very full indeed. Very full.